Viknesh Vijayenthiran July 29, 2011 Comment Now! BMW is working on a whole new range of eco-focused models falling under its recently established i brand, with everything from electric scooters to plug-in hybrid supercars planned. The first of these is to be an electric minicar called the i3, a car many of you will recognize as the long-awaited production Megacity Vehicle. However, the flagship of the range, and the model we’re most interested in, will be the new i8 plug-in hybrid supercar, a concept version of which has been revealed today at a special press conference ahead of its official world debut at the 2011 Frankfurt Auto Show this September. 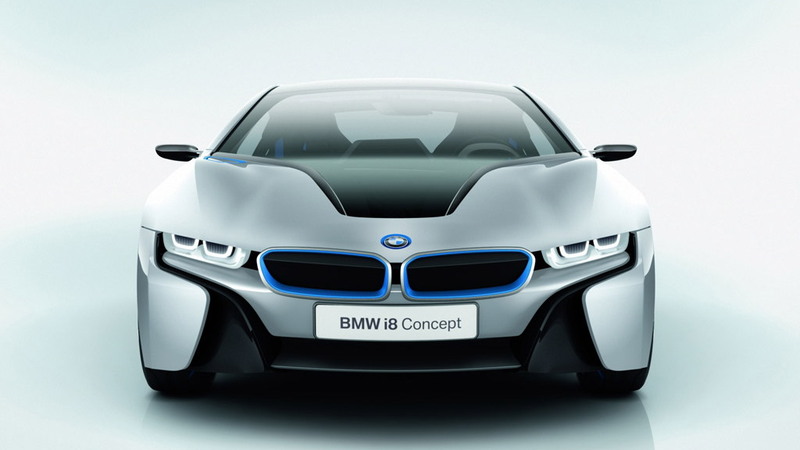 We’ve known about the i8 for a while, with BMW first previewing it with the original Vision EfficientDynamics Concept back in 2009--a concept’s whose lines have remained true over the years and can clearly be seen in this updated version. We’ve also seen a prototype version testing near the Arctic Circle, as well as another prototype being filmed on the set of the upcoming Mission Impossible 4 movie. 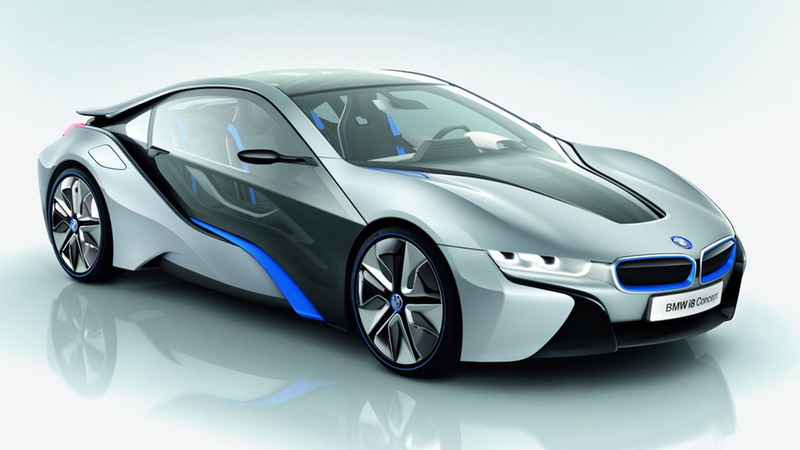 However, the latest BMW i8 Concept offers the closest look yet to the production version confirmed for launch in early 2014. Hit the next couple of pages for all the juicy details. The “LifeDrive” architecture, as BMW calls it, is the name of the design philosophy that’s gone into the car--a two-sided design that's comprised of the drivetrain and the body. In contrast to conventional vehicles with a self-supporting body, the LifeDrive concept essentially comprises two separate, independent functional units. The “Drive” module integrates the vehicle’s suspension, battery, drive system, and structural and crash functions into a construction made chiefly from aluminum. While its partner, the “Life” module, consists primarily of a high-strength and extremely lightweight passenger cell made from carbon fiber-reinforced plastic (CFRP). The use of this high-tech material across large sections of the car ensures that the body is remarkably light and, in so doing, helps to improve both range and performance. An electric motor in the front axle module and combustion engine at the rear are connected by an "energy tunnel" that houses the high-voltage battery. This gives the car a low center of gravity--and all the dynamic benefits that come with it. The positioning of the electric motor and engine over their respective axles and the space-saving and well-balanced packaging of all components also results in an ideal 50/50 weight distribution. The axles are also designed to deliver optimum handling properties, in keeping with the car’s sporting profile. Thus the multi-link front axle makes for an extremely flat and aerodynamically efficient silhouette while also eliminating any drive forces which may otherwise affect the steering, ensuring ideal handling. As for the exterior, it comes with typical BMW dynamic features such as pumped guards, short overhangs and a hunkered down stance. We especially love the wave that goes through the car, although the clear doors are a bit much. 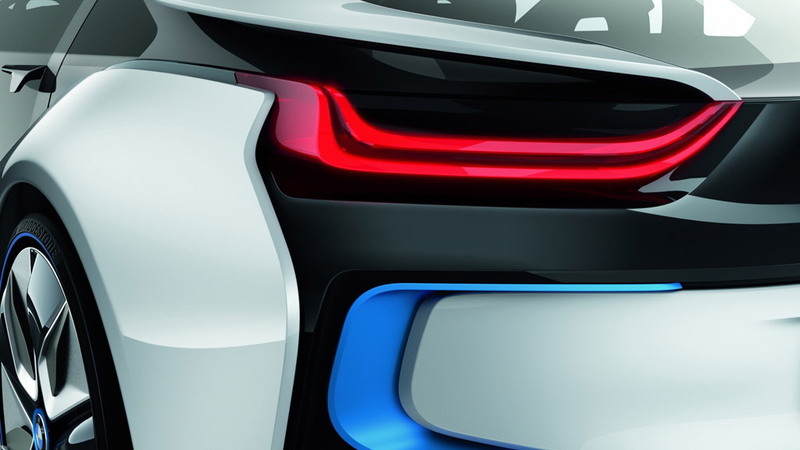 The full-LED headlights of the i8 Concept are designed as two U-shaped configurations. The sporty theme continues inside with the driver focused cockpit, a barebones race-car like feel and plenty of carbon fiber and aluminum trim. 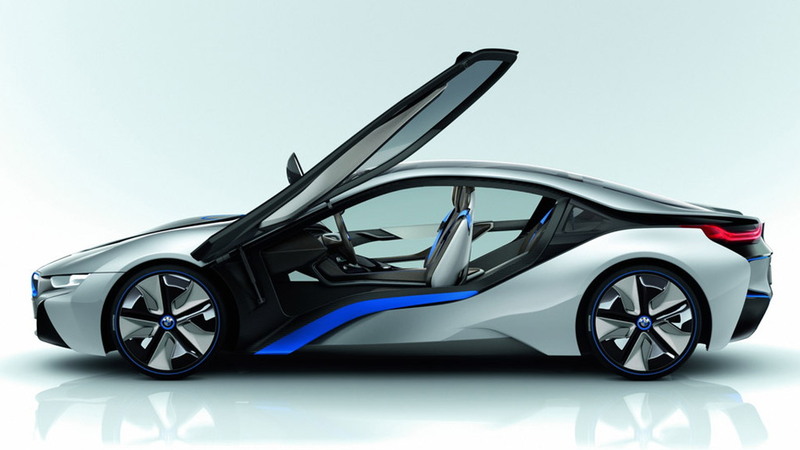 Power for the i8 comes from a combination of a turbocharged three-cylinder gasoline engine and an electric motor. You may recall the original Vision EfficientDynamics Concept featured a turbodiesel engine and two electric motors. In the case of the new i8, one electric motor, the same unit found in the i3 minicar but rated at a lower 131 horsepower, powers the front axle while the three-cylinder gasoline engine, displacing 1.5-liters and rated at 220 horsepower and 221 pound-feet of torque, drives the rear. Working in tandem, the sophisticated drivetrain will accelerate the i8 from 0-60 mph in less than 5.0 seconds and see it easily reach an electronically limited top speed of 155 mph. Note, French automaker Peugeot is on the verge of launching a vehicle with a less powerful but similar drivetrain, the 3008 diesel-electric hybrid crossover. Known as a “Through The Road Hybrid,” the setup can enable all four wheels to spin at the same time in an all-wheel drive configuration, whereas at other times only two wheels will spin--either the front or the rear. Depending on traction conditions and driving situation, intelligent driving systems ensure maximum energy recuperation without compromising dynamics and stability. This allows very high levels of energy recuperation even in the wet or in snow. BMW claims a fuel economy of around 78 mpg for the European combined cycle, which you’ll note is the same as that claimed for the Porsche 918 Spyder plug-in hybrid supercar also due in 2014. Thanks to its lithium-ion battery, which can be charged from a domestic power supply in around two hours, the 2+2 seater i8 will be able to travel up to 20 miles on electric power alone though this will be drastically shortened if full performance is employed. As a final note, the i8 is also expected to get the latest in mobile communications technology grouped under the BMW ConnectedDrive heading. Production will start in mid 2013 at a BMW plant in Leipzig, Germany, with deliveries to start in the earlier part of the following year. As BMW’s flagship, pricing won’t be cheap, with early estimates hovering around the $200,000 mark. This is not surprising given its likely competition and advanced plug-in hybrid drivetrain, however. 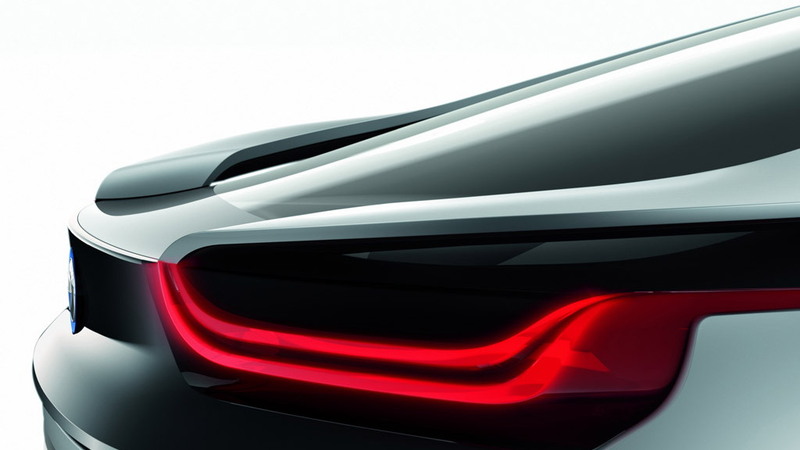 In the meantime, stay tuned for the respective debuts of the BMW i8 Concept and its all-electric i3 sibling at the 2011 Frankfurt Auto Show in September and our full coverage of the event.